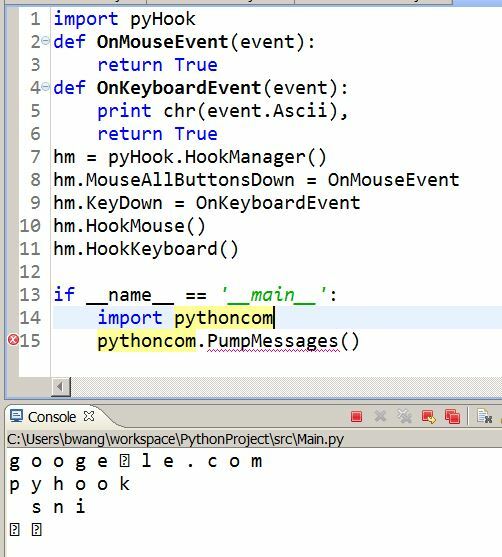 This is a python library who claims to “Python wrapper for global input hooks in Windows. The package provides callbacks for mouse and keyboard events; events can be monitored and filtered.”. It is hosted on Sourceforge and you probably also need to download pythoncom(which comes with pywin32) just to make the example work. After you started the python job. You can see all your mouser and keyboard activity has been logged! You can even see in the console that your activities have been printed to the stdout as shown in the example. I changed the function to only show the keyboard activity and convert the captured event to readable character. I guess this could be a double-blade sward that could either be used as a hacking tool or be used to capture your keyboard activity and a source to capture tons of data to do interesting data mining. My activity of searching for keyword pyhook in google has been logged.